Full of practical directions for navigating the travails of Regency life, this charming illustrated book also serves as a companion for present-day readers, explaining the English class system, currency, dress, and the nuances of graceful living. If you're an Austen enthusiast, there are probably some things you would like to know more about, even if they will be of absolutely zero real-world use to you. Riding sidesaddle, for instance. How does one, and why would one? And there are the things that maybe you should know, like how to behave at a dinner party; or moderately useful, or at least amusing things, like how to avoid dancing with an undesirable partner. This book is your one stop shop. Honestly, this book is a lot of fun. 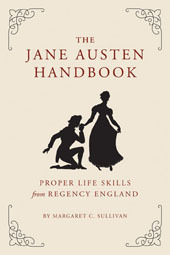 It makes use of instances from Austen's work as well as the realities of Regency life to create a step-by-step guidebook of What One Does and Does Not Do. All very proper, mind. And always tongue in cheek. Some of the things in it will serve as mere curios to the average Janeite (of the, 'Hmm, so that's why they do that' sort), or ambitious experiments to the more ardent fangirl. But some of the things in it could potentially be a lot of fun. For instance, you can learn how to net a purse, if you are so inclined. Or perhaps you'd rather make a filigree basket (ie. learn the art of paper quilling, which if you've never done is quite fun and utterly useless, unless you're a scrapbooker or card-maker. But it can be a rather impressive skill, and something to wile away the hours while you wait for the men to come in from their hunting party...). It reminds me a bit of the Daring Book for Girls in that, though you may never use a single piece of the information learned, you can feel rather smug for having learned it. And we all enjoy that, I should think. I have a feeling many readers' favorite part will be the section on "Making Love" - which has everything from showing interest without appearing forward to how to elope to Scotland (Note: do not use the Lydia Bennet Method). And I have a feeling Liz will be particularly interested in the section on entailments, as she tweeted me a question about the Bennet/Collins entailment last night. But my favorite part was definitely the first section of the book, that deals with the basics of, well, I suppose breeding. All of the things a proper lady would be raised to know. I fully intend to test the section on Identifying Quality in a real-world application, with its attached Field Guide to the Social Order. 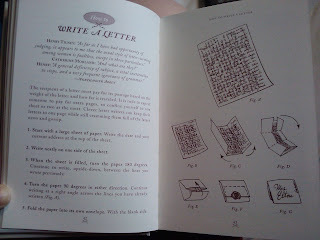 I may also try my hand at proper letter-writing; now all I need is some sealing-wax. All in all, I think the fun nature and very nice finishing on this Handbook make it ideal for the fully-stocked Janeite coffee table. 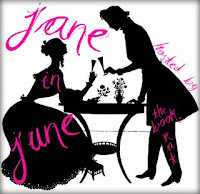 If your coffee table is looking a little bare, make sure to enter to win a copy of The Jane Austen Handbook here! I thought this book was fun, too, and it's a great addition to my JA shelves. I learned so much about the Regency period and laughed a little at the same time. I had not seen this book yet, it looks entertaining. Liz will be particularly interested in the section on entails. Liz has ordered copy of this book. Liz will not leave any more comments speaking in the third person. this book looks so cool. im gonna have to go get me a copy! thank you for sharing!